This is a wonderful service tray to have for any salon. It features an easy to clean aluminum stain resistant finish tray, a rolling sturdy black stand, and low center of gravity wide base for no tipping. **Appliance holder sold separately. ** • Stain resistant aluminum construction. • Sturdy black steel stand. • 5 easy-rollabout casters. 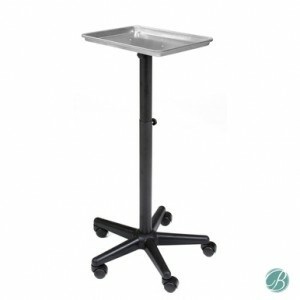 • Tray surface: 13” x 18” • Adjustable height from 26.75” to 42” • Base diameter: 21” Some assembly required.